Shapes cut from coordinating patterned papers can be a fun and attractive way to embellish your pages. This layout uses Sassafras Lass papers to show how circles of patterned papers can be used to create beautiful floral embellishments for your pages. This layout was created using three papers from the Sassafras Lass Tickled Pink collection (Tickled Pink Frolicking Paper, Tickled Pink Candy Paper and Tickled Pink Whirly Paper), pink Bazzil cardstock, pink ink and pink ribbon. Use your Tickled Pink Frolicking Paper as a background. Cut a strip of Tickled Pink Candy Paper measuring approximately 9.5cm tall and adhere horizontally across the bottom of your page. Adhere your pink ribbon along the join between the two background papers. 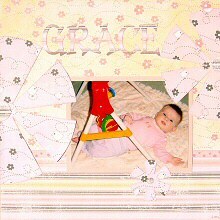 Mat your photo on pink Bazzil cardstock and adhere towards the bottom right of your page, as shown in the layout above. Next, create the small flower. Use this template to cut out a flower shape from the Tickled Pink Whirly Paper. You may find it easier to first cut out a circle, and then remove to pieces to create a flower. Ink the edges with pink ink. Cut the circle from the brown striped area of the Tickled Pink Candy Paper and ink the edges with pink ink. When dry, centre it in the middle of your flower. The remaining two flowers can be made in one of two ways. You can enlarge the template above. It will be blurry, but it will still give you the desired shape. Alternatively, cut two semi-circles from Tickled Pink Whirly Paper. One should be approximately 15cm in diameter and the other approximately 20cm in diameter. Use the above template to give you the angles at which to cut out your slices to give it a flower shape. When you have cut-out your flowers, lightly ink the edges with pink ink. Cut circles from the brown striped area of the Tickled Pink Candy Paper and ink the edges with pink ink. When dry, centre in the middle of your flowers, trimming the edges away where necessary. Once everything has dried, arrange your flowers on your page as shown in the layout above. Finally, cut your title from the pink and brown striped areas the Tickled Pink Candy Paper. Ink the edges with pink ink and adhere across the top of your page. If you wish, you can also add journaling in the bottom right-hand corner of your page. Patterned papers have so many uses in scrapbooking. They are great for backgrounds and for matting photos, but always remember, you can always use them to create beautiful and inexpensive embellishments for your pages as well!